Hazrat Shāh Ahmad Saeed Mujaddidi Naqshbandi Hanafi (1217-1277 AH) was the spiritual successor to the great Sufi master Hazrat Shāh Abdullāh alias Ghulām Ali Dehlavi (1156-1240 AH), may Allah be pleased with them. He was one of the chief scholars and shaykhs of Delhi in the 13th century after Hijrah (19th century CE), and probably the most prominent shaykh of the Naqshbandi Sufi order during that time. Most, if not all, followers of the Naqshbandi Mujaddidi order today trace their spiritual connection to him, excluding the Khalidiyya branch which is common in Central Asia and Turkey. He was also a great scholar and a Muhaddis. Many chains of authority (Isnād) in Hadith studies include his name. Not only Ahl-us-Sunnah but the Deobandi scholars also possess such Isnād and consider him with high regards. Shah Ahmad Saeed witnessed the emergence and spread of the Wahhābi sect in India. Before him, Indian Muslims were united in beliefs and practices and belonged to the Hanafi school of thought, with a Shia minority which was clearly distinguished from the mainstream Islam. However, the teachings of Ismāil Dehlavi introduced a big fitnah in the Indian Muslims who branched out in many different sects and schools, including Deobandi, Barelvi, Ahl al-Hadith (or Salafi), Maodūdi, Naturalist and others. This is not a place to discuss the full history of the Indian Wahhabi movement. But interestingly, many Naqshbandis today affilitate themselves to Deobandi school even with a spiritual connection with the Naqshbandi Mujaddidi tariqah. Deobandi school is a continuation of the ideas of Ismāil Dehlavi. So here I will discuss the reaction of the then Naqshbandi masters specially Shah Ahmad Saeed Mujaddidi to the newly emerged doctrine of Wahhabism, imported from Arabia by Ismāil Dehlavi. Molvi Ismāil Dehlavi, aka Ismāil Shaheed (1193-1246 AH) was the paternal grandson of Hazrat Shah Waliullah Muhaddis Dehlavi (1114-1176 AH). He wrote a book called Taqwiyat-ul-Iman which was based on the ideas of Ibn Abdul Wahhāb Najdī and was the first book to introduce Wahhabism in India. Ismāil Dehlavi was joined by some more scholars in this new movement, including his cousin Muhammad Ishāq Dehlavi. But most of his family scholars went against him, and some even wrote refutations of his works. Even his grandfather Shāh Abdul Azīz Muhaddis Dehlavi, who had lost his sight because of old age, when he came to know about this book, he proclaimed: “If I wasn’t disabled by illness, I would have written a refutation to it similar to Tuhfa Isna Ash’ariya”. (Narrated by Ismail’s cousin Maulana Makhsūs-Allah in his book Tahqīq al-Haqīqat). “He (Shah Ahmad Saeed) would not mention anyone with harsh words except the Wahhabi sect in order to warn people about their ugly beliefs and practices”. 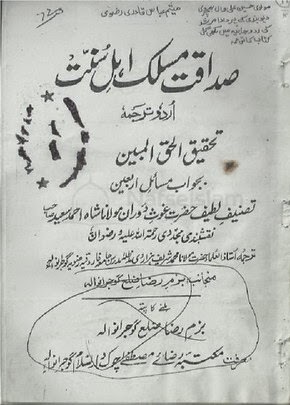 Here I want to discuss about the last book that he wrote as a response to the book Arbaeen Masāil by Molvi Muhammad Ishāq Dehlavi who had written his fatwas on forty important issues in the Wahhabi sect. Shah sahib refuted each of the original claims of the author and provided many proofs for the right beliefs and correct juristic rulings about those issues. Although the book is supposed to be for his followers so does not contain proofs for all of those matters (as merely his opinion is sufficient for his followers), he does provide many proofs from original sources of Fiqh and Hadith books. Urs of the Awliya for remembering them sending them rewards is allowed (Wahhabis consider it haram). Visiting graves is allowed for both men and women. Kissing the graves is allowed in some cases. Asking for help from the prophets and saints is allowed. Specially, saying Ya Rasool Allah is allowed (Wahhabis consider it Shirk and haraam). Covering graves of saints with clothes or flowers is fine. Making cemented graves and tombs over them is allowed. It is haram to consider the Holy Prophet peace be upon him as similar to other humans. He has fully explained this point at the end and decorated the book with the merits of the Holy Prophet peace be upon him. This wonderful book was first published 1318 AH.